Golf Oasis Anyone? Stay Right Next to Champions Gate! OASIS: Westhaven Estate, Davenport, Gated Sanctuary Community. 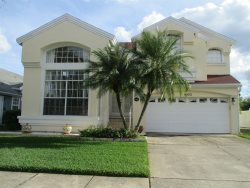 4 bedrooms - 3 bath, private pool vacation home. Located in the Davenport area near to Champions Gate and Reunion . Only 3 miles from I 4. Golf, grocery stores and numerous restaurants close by. Only 8.7 miles to Disney. 38 miles to Lego Land! Easy Access to all the action! The Oasis home's floor plan provides comfort enough for two families. The Oasis has a well equipped kitchen and a sunny pool with a spacious deck area. Bedding Configuration: Bedroom 1: King | Bedroom 2 Queen | Bedroom 3: (2) Twins | Bedroom 4: (2) Twins. Single Story 1800 square feet.